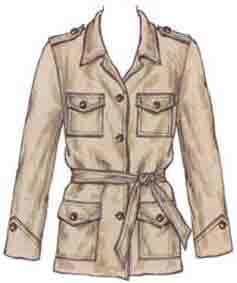 Image consultant Judith Rasband has suggested a ‘casual classics’ summer capsule of 6 items (in an e-mail dated 30 April 2012). This capsule immediately caught my eye because each item has interesting style elements, rather than being the simplest possible basic. Because of that, I don’t think these tops and jacket could be worn in all possible layering combinations. But they do give style effects from formal to casual to dressy. How about patterns for these ? – this on patterns for the original capsule. – a second post on variations in style (Variations on a summer capsule). Vivenne Westwood sleeveless top with ruched and pleated front, and side zip fastening. Many patterns for a simpler version of this, with drape neckline but not so closely fitted it needs an opening. Here’s new Vogue 8816. 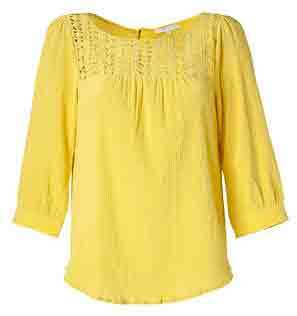 Paul & Joe Sister top with lace yoke, gathered lower section, three-quarter puff sleeves, buttoned opening down back. Again I would be more likely to wear a looser pullover version of this. I need layers even in summer, and I wear loose smock tunics. There used to be several top patterns with yoke at mid-armhole height, now they’re more difficult to find. Try Butterick 5217 – gather the lower section instead of pleating. Or keep the pleats if you prefer a flatter effect. 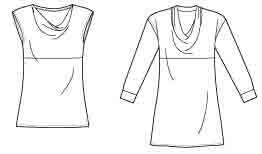 And lengthen the sleeves. Madewell shirt. With ‘boyfriend sizing’ it can be worn alone or as a shirt-jacket layer. So why not use a man’s shirt pattern. To get the over-sized effect, don’t choose a style which tapers to the hips. 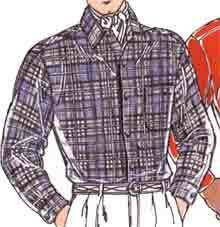 Here’s one of several men’s shirts from Kwik Sew : Kwik Sew 2000. The drawing is tapered but the pattern isn’t. Add large chest pockets if they look good on you. I like rounded corners and some pretty trim. More difficult to sew, but a better look for me. Alberta Ferretti cropped pants with side buttoned opening. Personally I look short legged in a cropped style. But ankles are a focus this season. And the last thing I need is a row of buttons drawing attention to my high hips. So use your favourite basic pants. I don’t wear knit skirts, they cling to every bump on my hips and thighs. And that waist swathe would be best avoided on my high hips. . . But I do love swirling around in a long skirt, even though it’s not practical for my everyday. Look for something fitted over the hips then flaring out. 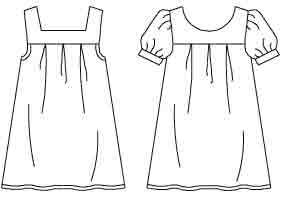 Many gored skirt patterns with this shape, but this is simpler. 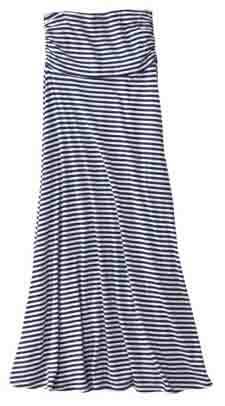 Simplicity 4881 for wovens – extend it to ankle or maxi length. 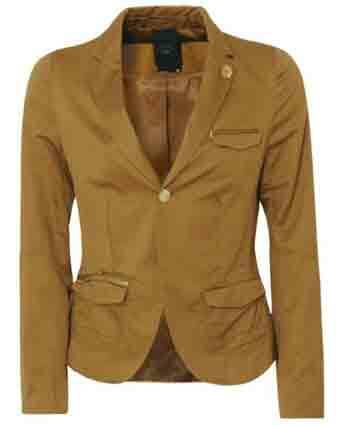 G-Star lined safari style blazer with interesting pocket detail. Basically a classic notched collar fitted lined blazer with added pockets. So add bellows pockets and zips to your favourite blazer pattern. Here are my blazer posts on style elements and sewing advice. 2 pairs of flat shoes – ballet flats and sandals. Wedge heels would also work with this group. Rasband has chosen leather, but the current rope trim and fabric upper sandals would also co-ordinate. Or fabric rather than leather ballet flats. Big bangle and belt go well with safari styling. These are bigger and more aggressive than I would wear. (Never a big belt across my hips :D) You could use softer or more ornate styling for jewellery and belts, especially if you don’t use a strictly blazer type jacket, and you round off the corners of style elements. 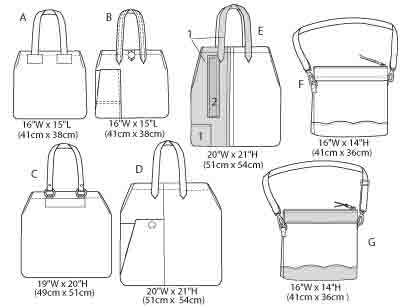 Rasband doesn’t show a bag, but this is a good group for wearing with a big fabric bag. Perhaps the new Marcy Tilton Vogue 8823. I have a second post planned on choosing a wider variety of styles for a similar capsule, and for making your look ‘this season’. This entry was posted on May 19, 2012 at 9:26 am and is filed under specific capsules. You can subscribe via RSS 2.0 feed to this post's comments. Both comments and pings are currently closed. The only item that wouldn’t really work in this capsule wardrobe, in my opinion, would be the draped top. I’ve made a few and I don’t find them to be very versatile. A simple tank (knit or woven) is much more practical for layering, either under the blouse, the shirt or the safari jacket. I have many tank tops, in various fabrics and many colors and wear them all year long. I would probably add a seventh item to the list : a slip dress, which could be worn alone or under any of the tops. Good points Sara. I agree the drape top isn’t easy to combine. One of the reason’s I like this capsule is because each item has more interesting style elements than the most basic styles. Even though that does make them more difficult to co-ordinate. Puts the focus on outfits rather than wardrobes. And a simple dress is a good extra for many people. Personally I haven’t got the best body shape for a slip dress. I like the new triangle shape. But they too can’t be worn under a blazer – they need something like a bolero or shrug. I love your blog! You put things together so wonderfully!